SIGN UP NOW WITH PROMO CODE "SONO4" TO GET 10% OFF THE COST OF THE CAMP! Grammy™ Award-winning drummer, author, and instructional DVD creator Stanton Moore (Galactic) hosts his Annual “Spirit of New Orleans” Drum Camp, December 9 – 11, 2016 at The Old U.S. Mint. 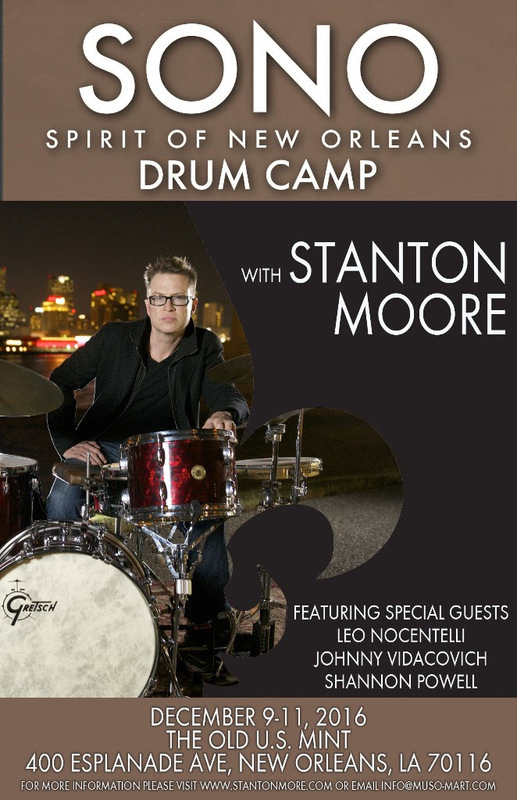 The exclusive “Spirit of New Orleans” Drum Camp will offer a limited number of students the chance to play with, and learn from internationally renown drummer Stanton Moore in an ultra-intensive classroom setting. Each student will play on an individual practice drum kit allowing for an incredibly intense, educational experience that guarantees results. Three, 8-hour days of specialized, small group drumming instructionPrivate Lessons with Johnny VIdacovich & Shannon PowellMaster Classes with Shannon Powell and Leo NocentelliEvening Shows in some of New Orleans' most iconic live music venues Chance to Perform on stage at Snug Harbor with Leo Nocentelli Fun!